It's time! It's time!! 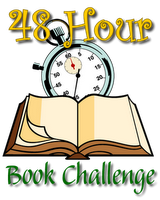 It's time for the 48 Hour Book Challenge, hosted by Pam at MotherReader.com. I love this weekend and I'm looking forward to delving into some GREAT books this weekend! I have a few things going on this weekend - we're spending time with our families on Sunday for Father's Day and we have an appointment for several hours on Saturday, but I'm hoping to be able to read & blog for 20 hours this weekend. My time will run from 2:30pm Friday to 2:30pm Sunday (although I will probably have to stop before 2:30pm on Sunday). I will be checking in periodically and posting short reviews (with longer reviews scheduled to post later in the summer).